Looks like a talent acquisition. Smells like a talent acquisition. Meebo, the chat and publishers tools company that Google acquired for roughly $100 million, is going to see most of its products shut down next month. That includes Meebo Messenger, the sharing widgets and mobile apps. 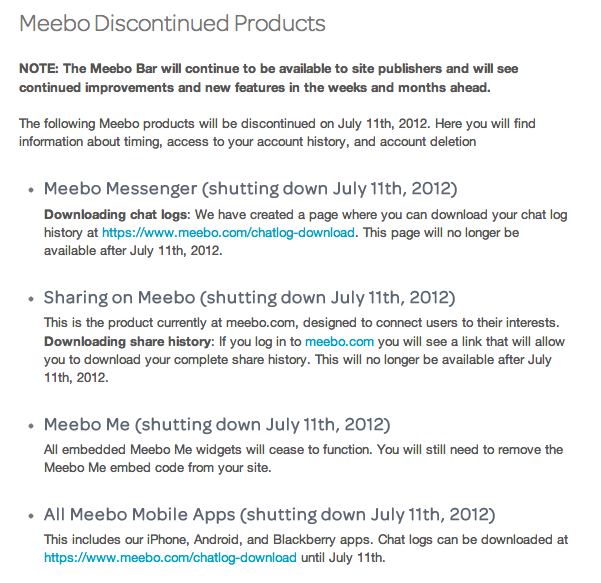 The one major product that will keep running is that Meebo Bar. (Yes, that one.) Haters aside, Meebo Bar does actually generate some meaningful revenue for publishers, but it sometimes irks visitors with ads that pop up from the bottom, left-hand side of the page. All of the products, except for the bar, will go down on July 11. Google typically shuts down products it doesn’t want to service when it has talent acquisitions. The reason? It costs money and time and it distracts the acquired team from working on things that Larry Page and Google’s senior management want them to work on. In this case, that’s Google+, which is Page’s Captain Ahab-like attempt to spear the white whale of Facebook. We reported earlier this week that Meebo’s product team will be using its expertise to help build out publisher tools for Google+. But Meebo had raised $70 million in venture capital. So a $100 million sale is not a win. Hopefully Meebo’s integration with Google+ will not make this tweet from Vic Gundotra, who oversees Google’s social efforts as a senior vice president, seem rather ironic.